I made the Giant City print for Helen Stickler for a screening of the documentary she made about me. 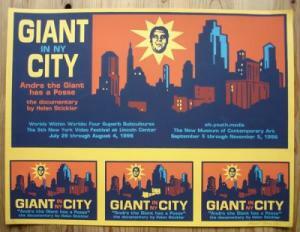 The print was designed to be placed in the storefront windows of some of Helen’s friends’ shops in New York City, and the postcard-sized images at the bottom were cut out and mailed as invitations to the screening. I was so poor at the time that I couldn’t afford to make real postcards, so I just combined the postcards and the posters onto the same sheet to save money.